By changing up the content mix, transportation centers have an opportunity to engage audiences that are already conditioned to separate advertising from informational content. From the control room to the concourse, the integration of AV into IP networks—traditionally the domain of IT managers—is changing how transportation facilities communicate with passengers. While in the past AV was limited in its ability to reach transportation audiences in real time, now the industry is embracing the benefits of full-scale convergence. “If you’re talking about transportation, you are in a situation where you need to deliver a coherent and consistent message for all possible channels, which means being able to deliver the same types of messages to displays, voice channels, and mobile phones,” said Petr Otoupal, managing director and co-founder at Simpleway, a unified passenger communication platform. Real-time supervisory control and data acquisition (SCADA) technology has enabled AV control rooms to embrace automation, allowing managers to drive content throughout the facility. And having content and control on one standard, along with low bitrate streaming, extends the AV footprint to wireless devices. The transformation of communication opportunities has evolved from pre-loaded advertising to real-time data such as gate schedules, weather updates, and news headlines. By changing up the content mix, transportation centers have an opportunity to engage audiences that are already conditioned to separate advertising from informational content. AtlasIED unifies public address and emergency voice/alarm communications systems (EVACS) under one networkbased infrastructure with the Globalcom system, providing high intelligibility, automation, monitoring, and system management. The system has been deployed at the Dallas-Fort Worth International Airport, one of the nation’s largest and busiest airport hubs. With such tools at the integrators’ disposal, engagement is emerging as a quantifiable objective. 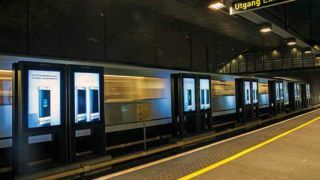 Advertisers looking for ways to engage passengers are exploring opportunities for interaction through digital signage, kiosks, and personal smart devices. IP-based communications and control solutions provider Barix has released its Audio Signage technology, for example, which allows users to hear audio from a digital signage screen by scanning a QR code linked to that display with a mobile device. Captive audiences—such as those using transportation systems—are a main target. Interactive technology is now going beyond pushing advertising and editorial resources, though, to get to the core of travelers’ needs—getting from point A to point B in as efficient a manner as possible. Digital signage that incorporates wayfinding tools helps passengers by providing quick and easy access to destination information on large and localized scales. “With the integration of data-rich programs like Google Maps, transit APIs, and other available systems, we can show public transport lines, update maps, and even follow stop schedules in real time,” said Eric Henry, vice president at Tightrope Media Systems. Taking the concept a step further, Simpleway is working to incorporate passenger demographics to deliver relevant content through digital signage, and to make sure the content is understood. For example, the signage in a baggage claim terminal could display the language spoken by the bulk of the passengers on a particular flight. If a flight arrives from mainland China, Otoupal noted, the signs could switch to Mandarin. Wayfinding can also play a critical role in crisis communication systems in transportation applications, by linking together a traditional P.A. passenger information system with its digital signage for use in an emergency. “Look at a situation where a fire starts somewhere,” said Otoupal. “The ability to switch that [digital] sign into one which shows the nearest emergency exit and potentially saves lives—it should be a no-brainer. On the client side, as well, the convergence of audio and video with control systems, augmented by technologies like wayfinding, has clear benefits that integrators should heed. Since happy travelers are inclined to travel more often, embracing automated AV systems should also be a no-brainer for facilities looking to grow along with their passengers.